I need it to shutdown my home server when it’s idle for a long time. Nothing very elegant, a bit of grep on ifconfig output but it seems to work fine. Have fun! echo "usage: bwusage [-h|--help] [-i|--interface ] [--rx-only]"
echo "               [--tx-only] [--traffic] [-t|--timeout ]"
[ -n "$VERBOSE" ] && echo "IFACE=$IFACE"
[ -n "$VERBOSE" ] && echo "TIMEOUT=$TIMEOUT s"
[ -n "$VERBOSE" ] && echo "TRAFFIC=$TRAFFIC"
[ -n "$VERBOSE" ] && echo "UNIT=$UNIT"
[ -n "$VERBOSE" ] && echo "... please wait $TIMEOUT seconds ..."
[ -n "$VERBOSE" ] && echo -n "RX: "
[ -n "$VERBOSE" ] && echo -n " $UNIT" && [ "$TRAFFIC" = "FALSE" ] && echo -n "/s"
[ -n "$RX" ] && [ -n "$TX" ] && echo -n "    "
[ -n "$VERBOSE" ] && echo -n "TX: "
There are huge security problems in doing this so you should absolutely limit as much as possible the privileges of the user running the terminal. Of course it’s not such a great idea give your root password to Gmail (unless you disable chat recording Gmail logs all your chats!) so don’t execute programs like su or SSH (although in theory you can do). You should not even let all your buddies to control the terminal. What I’ve done to test this plugin is create a new account and add only personal accounts as contacts. I’m not a code guru and I’ve wrote only a rudimentary very buggy terminal but in most cases it works decently. I apologize to the authors of rxvt from which I watched and copied part of the code. I really hope someone more experienced than me can help me improve the code. For now take it carefully and in no way consider this plugin safe or stable. Compiled on libpurple 2.10.0 (this means you have to use this version or newer!). For bugs reports, hints, … email me at federico.zanco ( at ) gmail.com. These are general instructions to build and install my purple plugins. Compile and Install (read INSTALL) or Download (from this page) the plugin for your arch. Restart Pidgin and in Tools/Plugins you should see Instant messaging Virtual Terminal. it’s case sensitive so write it exactly as above. In a while you should see the prompt. #Help to get a quick help that display some useful private commands. In general all private ImVT commands starts with a #. An interesting command is ‘##‘ (direct input) that allows you to enter text without confirm it with return. Street, Fifth Floor, Boston, MA 02111-1301, USA. Fetches and prints external IP address of the machine where the plugin is running. By default the URL used is http://checkip.dyndns.org but you can change it in the plugin’s settings adding a regex to parse the html retrieved. Compiled on libpurple 2.10.7 (this means you have to use 2.10.X or newer!). For bugs reports, hints, … email us at riccardo.catto ( at ) gmail.com and federico.zanco ( at ) gmail.com. Restart Pidgin and in Tools/Plugins you should see a plugin named What’s my IP. Once enabled every buddy in buddy list can ask your external ip address writing ‘ip’ in a instant message window. By default the plugin uses http://checkip.dyndns.org to fetch the ip address but you can change it in plugin’s settings changing the regex to parse the url too. Creates a dummy port forwarding on demand between two buddies via instant messaging. The bandwidth is not spectacular but sometimes it could be useful (i.e. to screw a poor firewall). It’s a toy plugin that exploits once more the possibility to carry traffic via instant messaging. Compiled on libpurple 2.10.6 (this means you have to use 2.10.X or newer!). Restart Pidgin and in Tools/Plugins you should see a plugin named Instant messaging NetCat Port Forwarding. 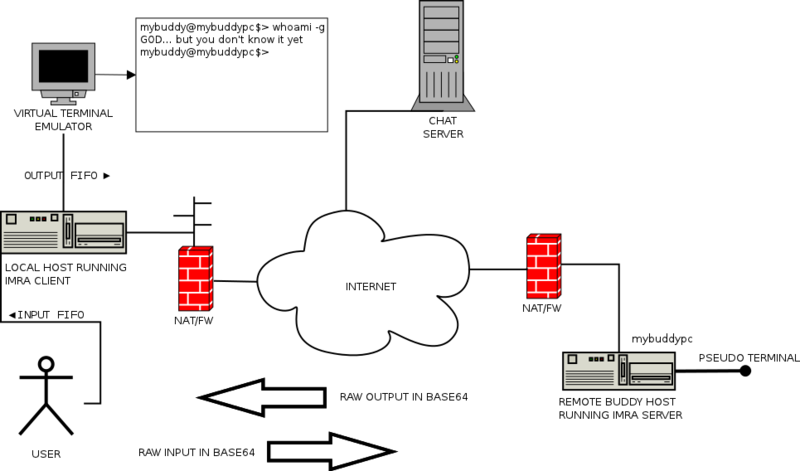 creates a port forwarding from localhost:5000 to www.example.com:80. If you open the address localhost:5000 with your browser you should see the page of example.org. It’s a toy plugin, all the sockets stuff is demanded to ncat for simplicity and to avoid to manage I/O with blocking functions. Next step would be to implement a real server that accepts many connection keeping them separated. The main issue is to do that using only non blocking system calls. Policy settings are available in plugin settings. To add/remove a buddy to a ACL just right click on the buddy and choose the operation. “Which ACLs” tells in which ACLs buddy is subscibed. Let’s say that Buddy A wants to run a shell session on Buddy B’s host computer. So in A’s PC the plugin client is installed and in B’s PC the server. I’ve tried to make a plugin to realize a virtual terminal emulator in a chat between two buddies but I could create only a small, very incomplete (and buggy!) proof of concept. The problem with that plugin was that a terminal emulator it’s something very complex and there’s no complete libraries that implements the “backend” only (I mean that manages only the virtual terminal) so I had to develop the terminal emulator inside the plugin and that was a huge work (and of course incomplete!). The real problem are escape and control sequences, how to pipe in and out form terminal and manage them. There are libraries like VTE but you can’t use them without a GUI (the main reason that push me to develop such plugins is that I want a remote access through nat in a remote (home obviously :)) server without GUI). There’re some libraries not really well done (IMHO) like libROTE (no more developed) and a derivate libvterm but they do, maybe a little better, what I already do with ImVT plugin but far away to be effectively usable. Take a look at Miguel de Icaza’s blog to get an idea of what should be done. The idea behind this plugin is to forward raw user input (signals included) from local host to terminal and forward all terminal output (escape and control sequences) to a virtual terminal emulator (i.e. xterm). Doing this then the virtual terminal emulator will interpret escape and control sequences correctly. The screenshots show how I could run safetly htop and vim (no more problem using arrows). The console is a little application to simplify client input/output. I’ve added Access Control List mechanism to choose which buddies are allowed to REQUEST, STEAL or RESET sessions. ACLs are the default choice for each operation. You can modify default policy in the server plugin settings. To add/remove a buddy to a ACL just right click on the buddy and choose the operation. “Which ACLs” tells in which ACLs buddy is subscibed. I could see some odd behavior i.e. with Home key. Let’s debug! Command #IMRA_RST# implies SERVER close the active session if any and listen for new requests. Compiled on libpurple 2.7.11 (this means you have to use 2.7.X or newer!). If you want to use imra_console (recommended) you should install it in a directory on your path (make install will install it in /usr/local/bin and you have to be root to do this). Once enabled you should adjust settings. Buffer dimensions it’a a try/catch task. I’ve noticed that Gmail starts to loose messages if you send a lot of messages in a short interval. it’s case sensitive so write it exactly as above. If there’re no errors, two FIFOs will be created. Default paths are /tmp/imra_input and /tmp/imra_output. Open a virtual terminal emulator (i.e. xterm, gnome-terminal, konsole, …). In the virtual terminal emulator you can use cat command to write input (i.e. $ cat >/tmp/imra_input) and read output (i.e. $ cat /tmp/imra_output) or simply start imra_console (it tries to open default FIFOs but you can specify them passing -i and -o options). That’s all. Policy settings are available in server plugin settings. To add/remove a buddy to a ACL just right click on the buddy and choose the operation. “Which ACLs” tells in which ACLs buddy is subscibed. [31/12/2011] Now stripping markup in new status when updating shared status to prevent markup being sent and shown on other Google shared status capable clients. Thanks to Cyryl. Restart Pidgin/Finch after installing and remember to enable the plugin. To visit the PPA archive go to https://launchpad.net/~federico-zanco/+archive/ppa-gss. [13/10/2011]: Some people have reported that when they change status to Invisible and change again to another status (Available, DnD, …) the status remains invisible. I can’t reproduce this so please send a debug window log (menu Help\Debug Window to open debug window, just copy and paste text) while reproducing this bug. I’ve created an autotools version tar.gz and added a bit of localization support (there’s only italian for now 🙂 but if anyone wants to contribute…) to make package building an easier task. Note that the other tar.gz version don’t have localization. You have to choose what accounts use Google Shared Status in plugin options. Now it works with Google Apps addresses too. The plugin is written to work with libpurple, so it (should) work with Finch, …, too. The statusbox and the icon in notification area are manged in a quite tricky way in Pidgin. So it can happen that Pidgin doesn’t report correctly the current status of the resource (which is the shared status). I’ve added a mode called Unique shared status that propagates every change of GSS of any account to any other active Google account. With this option disabled, all accounts are managed indipendently. Unique shared status is enabled by default, this means that every change in a resource which address is managed by Pidgin/Finch propagates to every other account managed. I.e. if I use three Google email addresses : pizza@gmail.com, spaghetti@gmail.com, mandolino@italy.it (Google Apps) and I use Pidgin at home managing pizza, spaghetti and mandolino and Gmail (web client) at work managing pizza, if I set the status “Prosecco is my favorite white wine” at work, this be set by Pidgin for pizza, spaghetti and mandolino too. There’s an issue when you change from status Invisible to Idle/Away: shared status does not manage Away/Idle that is a per-resource task. I cannot find an effective solution because I can’t simply switch to Available/DnD first and then to Idle/Away (maybe this will become a plugin option). This would change the shared staus of all active resources to Available/DnD and then only Pidgin/Finch resource to Idle Away and maybe this is not what we want. For now I’ve only added an alert to warn the user that changing from Invisible to Idle/Away will leave the shared status invisible and, if he/she wants, to switch to Available or DnD first and then to Idle/Away. The plugin should work with multiple accounts. add an option to force Pidgin (or other clients) status at startup. So many packages… which one to choose? 31/12/2011 0.2.5 Now stripping markup in new status when updating shared status to prevent markup being sent and shown on other Google shared status capable clients. Thanks to Cyryl. 16/10/2011 0.2.4 Changed the default behaviour on plugin load. Now all accounts are enabled by default. 13/10/2011 0.2.3 Quick fix to manage namespace prefix in shared status XML. 15/07/2011 0.2.2 Added an alert to warn the user when changing from Invisible to Idle/Away. 10/07/2011 0.2.1 Now you can/have to choose what accounts should use GSS. 10/07/2011 0.2 Added a way to check Google Shared Status compatibility. Now you use google apps email address (no need to be gmail.com). Found a way to manage status and added the Unique shared status that propagates every change of GSS of any account to any other active Google account. (or maybe only libpurple if in your os they are distribuited separately). is to download the binary directly from site. I’ve included the Mingw Makefile that I use to build my plugins for Windows. 1) Compile or Download the plugin for your arch (see above). 3) Restart Pidgin and in Tools/Plugins you should see Gtalk Shared Status Plugin. In plugin options enable/disable Unique shared status options and enable/disable accounts that should use Gtalk Shared Status. Simply enable the plugin and just change to your favourite status. Note that at startup the plugin reads and sets the status saved on the server. The plugin (should) works with multiple accounts. You should have received a copy of the GNU General Public License along with this program; if not, write to the Free Software Foundation, Inc., 51 Franklin Street, Fifth Floor, Boston, MA 02111-1301, USA.